Hello, all my favorite boys and girls. Are you ready for some more of my wisdom about writing? Well, I don't know how much is wisdom and how much is desperation, ha ha. When I began writing fiction, the first thing I did was go to the library to see what it had in the way of helps. I searched the card catalog (this was before the spread of the internet) for "How to write" and found several great books on the subject. Books by Dean Koontz, Jack Bickham, Ronald Tobias, among others I can't recall right now. To me, the best was "How to Write Best Selling Fiction," by Dean Koontz. That may be the reason I quote him so much. As I thought about a story line, I realized I needed to do some research. The first things I consulted, believe it or not, were my high school year books. Since I'd decided I wanted my novel to be set there, I wanted to make sure I described things as accurately as I could. 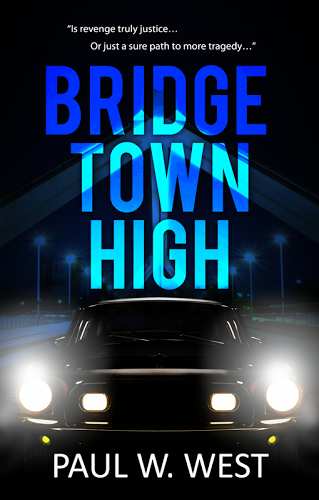 Several of you have commented in your reviews how they could visualize the places and events I described in "Bridgetown High." Then, knowing I would likely portray kids with drugs, I did research into drug addiction and effects of taking mentamphetamines with alcohol. That research brought me to write one of the most dramatic scenes in the book, but it also let me know when I've overdone it. Here is an exerpt of that scene. To give you a bit of lead up, Alan had bought meth and stole some beer for a drug party. Then he and Jeff, Genie, and Chris went for a joy ride across the Carquinez Bridge. There's more, but I have to keep something for you to wonder about, he he he. I also won't give you the outcome of this little chase scene, he he he. Enjoy! “No! Bobby, no!” Chris yelled as Alan leaned over the steering wheel so Bobby could push the door open and get out. Bobby didn’t answer. Then Genie saw the pistol in his hand. Chris grabbed Bobby’s shirt as he climbed out, “Bobby, No! Don’ do it. Get back in here!” Tears were streaming down Chris’s face as she tried to hold onto his shirt, but he pulled away from her. Then she screamed again, this time in Spanish. “Bobby,” Genie screamed too. “Get back in here. You’re going to get hurt.” She wanted to say killed, but couldn’t bring herself to say it. Horns blared as cars passed, barely brushing past Bobby and Alan’s open door. He dodged one car, then another, then dashed to the front of Alan’s car, then to the narrow sidewalk. Chris reverted to English. “Bobby! In the name of God, get back in here. You acting crazy,” she yelled at him. “You loco man!” But he just stared down at the ship under the bridge. “You going get kill out there,” she kept yelling. “Please! Get back here. Oh, my God, Mother Mary, and Joseph!” Chris and Genie made the sign of the cross together. “I got to see this too,” Jeff said, as he pushed Linda’s seat forward and climbed out to join his friend. Genie dropped her face into her hands, forgetting for the moment her migraine. Then popping noises made her look up again. Bobby was shooting at the ship as more cars passed by, honking. Genie glanced behind them and saw the red flashing lights from an approaching squad car. Above the noise from the stereo, she could faintly hear the wail of its siren. She prayed the officer would stop them before somebody got hurt. Jeff jumped back in next to Genie while Bobby ran back around the front of the car. As he darted to the door, another car passed at that same moment. Genie felt and heard the hard, dull thump, and she and Chris screamed as Bobby’s body hurtled into the air, into the path of another car. Genie’s stomach wrenched as Bobby’s blood splattered across the windshields of both cars and his body bounced again on the pavement where another car screeched to a halt over his lifeless body. Traffic on the northbound span came to a quick halt. Through her tears, Genie could see the highway patrol car struggling through the tangled traffic. Please hurry! she prayed. Alan swore and stomped on the gas pedal, peeling rubber. At the toll booth at the end of the bridge, two black-and-white highway patrol cars waited with red lights flashing, ready to intercept Alan. Alan swore again as he hit the brakes and spun a sharp left. He slid into the turn out before the toll plaza’s office building. It was designed for people to turn around if they’d gotten on the bridge by accident. Alan skidded on some loose gravel, then merged with the southbound traffic back to Crockett. While Chris screamed, Genie glanced out the back window again. As she hoped, the officers had joined the chase. Turning back to the front, she held on tight as Alan cut in-and-out of traffic again. He had a crazed look in his eyes. The bridge, cars, and everything passed in a blur. Alan was going to kill all of them. Genie knew it. All the while, Linda just stared out the front window, a blank expression on her face, while Chris screamed at Alan, in Spanish again. Genie was too frightened to speak, or even scream. She knew Alan wasn’t in his right mind, and she struggled to keep bile from rising in her throat. Alan cut across two traffic lanes in front of other cars that honked as he did, and veered off onto the exit. The highway patrol cars were a half-mile behind them. Please hurry! she prayed again. Alan and Jeff both swore and Genie looked back to the front. A county sheriff’s squad car was blocking the end of the off-ramp, a deputy stood beside the car with his gun in one hand, and a high-powered flashlight in the other. He aimed both it at Alan. Alan targeted his car to the rear end of the squad car, like a demolition derby, and stomped on the gas pedal. “AAAAAHHHHH!” he screamed. Genie dropped to the floor and Chris fell on top of her, still screaming in Spanish. This was it. Genie felt a strong jolt and heard breaking glass and clashing metal. Unable to control it any longer, she vomited on the floor, then felt the car accelerate again. It wasn’t over. Chris fell silent for a moment and sat back up. Ignoring the sickening slime on her hands and chin, Genie crawled back to her seat, too. The hood of Alan’s car was crumpled, but the collision hadn’t been enough to stop him. Genie looked out the rear window as the squad car’s gas tank exploded, and the sheriff’s deputy ran from the flames. Chris prayed her rosary in Spanish, and Genie decided a prayer wouldn’t hurt her either. Dear God, help! She couldn’t think of anything more to say, but kept repeating the words in her mind, genuflecting with each repetition. So, did you enjoy that? There's more like that in the book, "Bridgetown High." Check it out.